The courses on this page are for Intermediate and Advanced levels. You might also be interested in our new Professional Development Program. Pre-requisites: a minimum two or more beginner’s courses with us or equivalent experience. If you have learnt elsewhere or are unsure of your level please call us on 99437844 to discuss your needs before enrolling as we do not give refunds. Times: Choose one of Monday or Tuesday Mornings (10am – 12pm) or evenings (6.30 – 8.30pm). Content: These eight-week courses are offered four times per year ie: 4 Terms per year. Students enrol one term at a time and attend at the same time once a week. The courses provide a developmental pathway for learning more complex techniques and encourage individual development and designs. 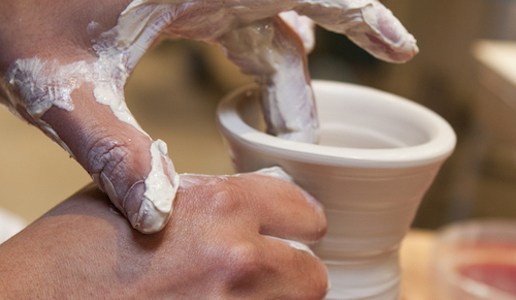 Whilst primarily focussing on the skills of the potterʼs wheel, we also introduce some hand-building techniques and encourage an outlook for experimentation and open-ended exploration. A rich pathway is offered within an imaginative and creative framework. Students will build upon the Japanese techniques they learnt in our Beginners classes and experience a range of other techniques suitable for larger and more complex forms. They continue to underpin their practice with awareness of ergonomically sound techniques. Demonstrations to the group are offered in every class and students are supported to move to individual design and progress as and when their skills permit. Students have the option to hold their place from term to term or book for one year at a time (please call us to ask about the generous discount). Fees: $508 Earlybird/FT Student/FT Potter and conc, $535 Normal. The class fee is fully inclusive of materials, unlimited house clay and glazes and access to all studio equipment and tools. Firing is $10/kg payable at the end of the term upon collection.